Last of their hits before it was all over. Nice and bright popsong, though. 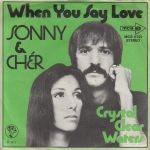 Solos sung by Cher as well as Sonny. Peaked at only # 31 exactly (oh my Gawd) 32 years ago: September 9, 1972.